The difference between a brig and a snow is that a snow has a trysail mast and a brig doesn't. The trysail mast is a small diameter mast stepped directly aft (behind) the main-mast, to which a gafsail (or trysail) was bent. Notice how Ontario's trysail mast is stepped quite a distance behind the mainmast. 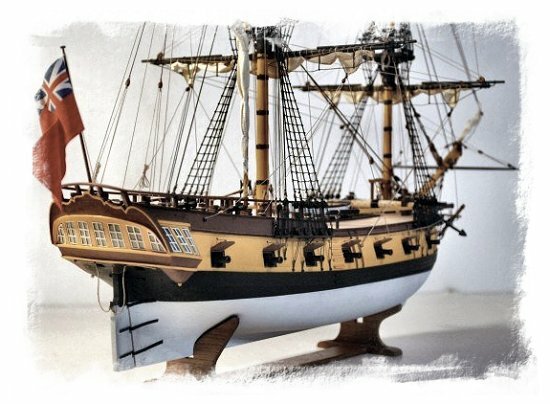 The model is flying the red ensign (or duster) from before 1799, since she was part of the dominant British squadron on Lake Ontario. The design of the red ensign changed slightly in 1799 to include the familiar red stripe lining the white cross, which is still missing off Ontario's flag. 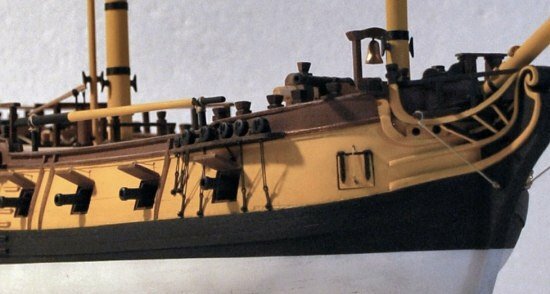 Closer view of the spar crutches holding the spare fore and main topmast while the model was still under construction.